We have teamed up with over 80 businesses to provide special offers and discounts for teachers in Southern Arizona. All K-12 district, private and charter school teachers can participate. Explore the index of our discount card participants below. To get your discount card, simply submit the form below. We’ll e-mail your card to you, along with a special discount card from OfficeMax/Office Depot. Take both cards to any Tucson-area OfficeMax/Office Depot for free lamination. And remember that you must always show a valid teacher ID or recent pay stub with your card to receive our exclusive deals. Thank you for all your hard work and contributions to Arizona’s students! With special employee discounts and the highest levels of service there’s never been a better reason to rent with Avis! Teachers can save Up to 25% OFF Base Rates at Avis. Click on the link below and enter AWD#: D134100. 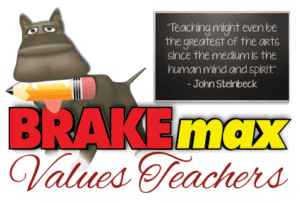 Brake Max Auto Glass is very proud to be a part of Tucson Values Teachers. In Pima County, there are two types of vehicles: vehicles that have windshield damage, and vehicles that will. 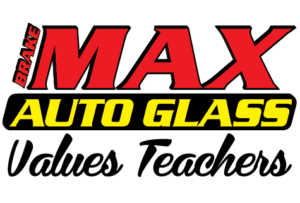 Whichever category your vehicle falls under, Max Auto Glass will be there for you with FREE mobile service to your home, office or any BRAKEmax location. BRAKEmax Car Care Centers supports, honors, and respects our teachers and support staff. We appreciate all the hard work and love that goes into teaching our kids. To that end, we are proud to offer teachers and support staff 10% off their regular-priced service at BRAKEmax. BRAKEmax has 14 locations throughout southern Arizona. Budget-Rent-A-Car is one of the leading, most trusted providers of affordable and reliable car rental for the value-minded consumer. Teachers can save Up to 25% OFF Base Rates at Budget. Click on the link below and enter BCD#: Z408900. Enterprise Rent a Car is an extended family of more than 65,000; a world-class company with homegrown roots. Employees can save 5% OFF at Enterprise. Click on the link below and discount will automatically be applied at checkout. Hertz offers savings and benefits wherever you rent — with 1,000 airport locations and over 1,000 locations across the country. Teachers can save Up to 25% OFF Base Rates at Hertz. Click on the link below and enter CDP#: 1742729. At O’Rielly, we appreciate the contribution teachers make to the children who will be our future community leaders and are pleased to offer a range of discounts. Benefit for teachers has two components that together offer a 25% discount when you visit for maintenance or repair service. 1. Free enrollment in O’Rielly Rewards, our generous rewards program which gives you 15% of every purchase into your Rewards account to use like cash on future purchases. Use 5% of your purchase towards future Service; Use 10% of your purchase towards the purchase of a new or used vehicle. 2. An additional 10% off all maintenance or repair service and parts at the time of purchase. EXAMPLE: Total cost of repair is $70. Teachers pay only $63 and earn $9.45 in Rewards dollars. To make an appointment, call (520) 829-4405, or drop in. Free shuttle to school, home or Park Mall and complimentary refreshment in the Corvette Cafe. We have the largest inventory of new Chevrolets in Southern Arizona. Benefit for teachers: On every new vehicle in stock teachers received special pricing which is a set below-market price. The GM Educator Discount Program is only offered to Educators in any school district. No negotiating required. Plus a $100 “treat yourself” VISA gift card with any purchase so you can, well, treat yourself. With an O’Rielly Used Car “you get more.” Every used car has passed a 117-point inspection, is squeaky clean, and comes with a 30/90 day warranty and a 30-day satisfaction guarantee. Benefit for teachers: On every used or certified pre-owned vehicle in stock, teachers pay only the employee price, which is a set, below-market price available only to newly hired employees. No negotiating required. Plus, a $50 “treat yourself” VISA gift card, so you can, well, treat yourself. Our award-winning body shop works with all major insurance companies to ensure the best repair as quickly as possible. Benefit for teachers: If your vehicle repairs total $2,000 or more TVT members can choose from one of these added value options: (1) O’Rielly will pay $100 of your insurance deductible (not available with some insurance carriers), or (2) O’Rielly will give you a rental car for up to 10 days while your repair is completed, or (3) O’Rielly will complete a free premium detail on your vehicle before you pick it up. 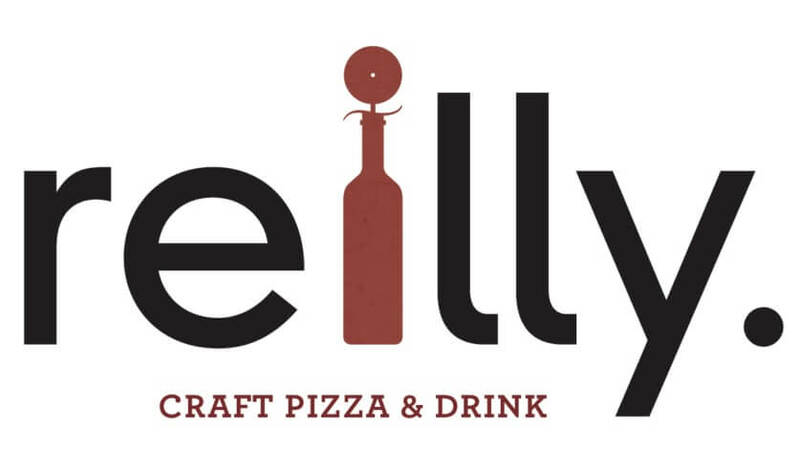 All services of O’Rielly are located at 6100 E. Broadway Blvd., next to Park Place Mall. More information can be found at orielly.com or by calling (520) 747-8000. RCG Auto Transport offers a 10% discount on nationwide vehicle shipping to all teachers in relation with Tucson Values Teachers. To obtain the discount the teacher needs to get a quote on the RCG Auto Transport website and then provide them with proof of a teacher ID by sending them an email. A special welcome to our community’s teachers! In appreciation, we offer you 10% all parts and labor. And to keep you coming back, you will receive a coupon for $10 off your next visit. From oil changes to complete restorations, Village Automotive of Marana delivers quality repairs & service at a reasonable price. With over 38 years as an ASE Certified Master Technician, Owner Paul Frederick uses the latest diagnostic equipment, saving you time and money. 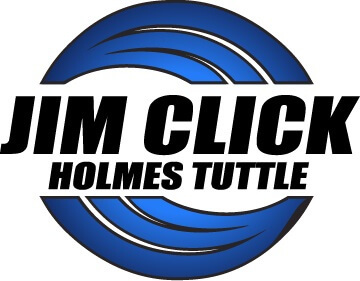 He will provide an estimate and explain the reason for any repairs before beginning work on your car. Most repairs are guaranteed for one year or longer. Located in Marana, AZ, we are also proud to serve Dove Mountain, Avra Valley, Oro Valley, Northwest Tucson, Red Rock and surrounding areas. Earn PREMIUM INTEREST and SAVE UP TO $120 IN WAIVED FEES! The GUARANTEED minimum interest rate on PremiumPlus accounts adjusts quarterly (currently 1.20% annual percentage yield through March 31, 2010). Direct Deposit required. Horace Mann has special rates for educators, and you could save up to 20% with our multiline and educator discounts. Horace Mann products have educator discounts and benefits above normal discounting. I am glad to work with you and your campus on Perfect Attendance (Achievement) Programs, DonorsChoose.org, and State Teacher Retirement Seminars. We are here to help you, because you are helping our most valuable resource! Jeff Ell, a Real Estate Professional with Keller Williams is offering closing cost assistance to all Tucson Teachers. Jeff is offering $500 towards the client’s closing costs or as an interest rate buy down, whichever works out in the best interest of the client. This credit is available for teachers in Pima County who are selling or purchasing a home and will be applied at close of escrow on a transaction where Jeff Ell represents the teacher as a client. This offer is limited to one transaction per teacher per year. For questions or more details, please contact Jeff via email or phone: jeff@elltucson.com or 520-780-7983. Peter Schmerl, a local estate planning attorney, will provide a FREE will for teachers – this is a will without trust provisions. Contact Mr. Schmerl at Peter.Schmerl@azbar.org and visit his web site at www.azwillsandtrusts.com. As a valued Pima Federal Credit Union member, your Tucson Values Teachers (TVT) Discount Card entitles you to skip a payment on your credit union loan during the summer months. Additionally, if you have more than one loan, you can skip a payment for each! Simply select the month you’d like to skip (June, July or August) and we’ll take care of the rest. CLICK HERE to fill out your Teacher’s Skip-A-Payment application. Email your completed application to skipapayment@pimafederal.org or fax it to 520.202.0727. One of a kind government program for all teachers, current or retired. Program allows them to purchase a home with only 1.5%. FHA Home loans typically require a 3.5% down, but for teachers, this program will gift them 2%. The 1.5% that teachers would need to come up with can also be gifted by family member or friend. This program has no restrictions and is completely forgivable. Doesn’t hinder their resale or refinancing options once they purchase the home. This grant program is available until the end of the year and no other lender, bank or mortgage broker has it. We love giving back to those who help shape our community, this is our way of paying it back to all our teachers. 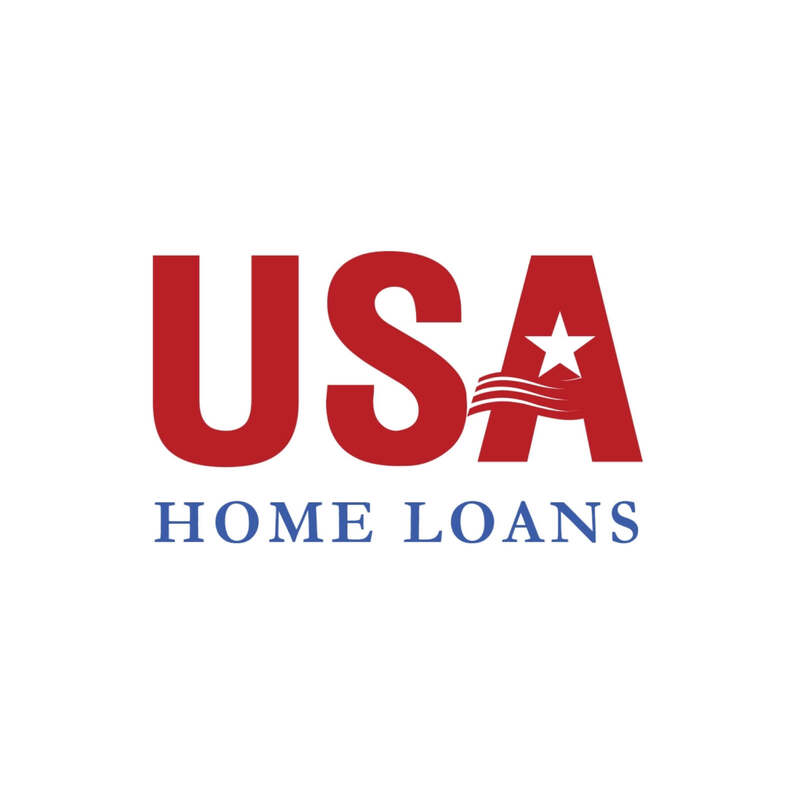 Vantage West Hero Loans — A mortgage program designed to fit the unique needs of teachers. Our office specializes in individual care in a calm and welcoming environment. Dr. Anne Stolcis has been practicing in the Tucson area for over 20 years. We are a preferred provider for Delta Dental. Alvernon Optical, Inc. wishes to thank the many teachers who have dedicated their lives to educating our children. So many teachers go above and beyond, each and every day, for the future of our kids and for your commitment we thank you! Established in 1961, Alvernon Optical (family owned and operated) is Tucson’s premiere one-stop-optical shop, offering everything from eye exams, to eyeglasses, frames, lenses, contacts, repairs and accessories at any of its six convenient locations. Alvernon Optical also offers a wide variety of specialty eyewear, including Name-brand and Designer frames, Safety and Occupational eyeglasses, as well as a complete selection of prescription and non-prescription sunglasses, cycling glasses, prescription dive masks and swim goggles. Most insurance accepted & prices to fit every budget. • Discounts may not be combined with any other offers. Teacher Tuesday Discount: Teacher’s may choose any membership for one low cost. You can choose from a 12, 18, or 24 month membership for only $30/mo.! Regular memberships range from $33-$39 a month. In addition, you will receive 3 FREE personal training sessions, a Fitness Consultation, a 30-day Get Started Plan, an Orientation on equipment, and don’t forget a little swag bag to go with it! That’s almost a 30% discount. The one-time key fee will also be reduced 90% to $5. Arizona Periodontics offers a discount special just for teachers! 10% off on the patient’s out-of-pocket cost. Dr. Andrew Deeb, D.M.D., M.S. 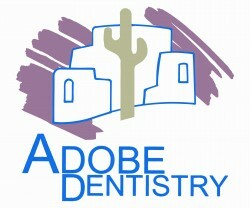 is a Board Certified Periodontist and has been practicing in Tucson since 2002 and in Sierra Vista since 2003. Arizona periodontics is always accepting new patients and would be happy to answer any questions you have. We accept most insurance plans and financing is available. BodyBasics Health & Fitness provides a special discounted rate JUST FOR TEACHERS — $12 per class ALL group classes! Regular cost is $20 per class. Call us to schedule 498-0359 or use our online scheduling option. Explore Body Basics class schedule here. Take your power back and start 2017 out healthy! Strength, cardio, flexibility and nutrition = the 4 pillars of fitness. We will teach you how to achieve total and complete balanced fitness by incorporating all of them into your daily lifestyle equally. We have an Oro Valley Fitness Boot Camp (six to choose from), Tucson Fitness Boot Camp (five to choose from), and a Marana Fitness Boot Camp (two to choose from). Thirteen different camps to serve your fitness needs! 39 classes to choose from in the early morning, mid-morning and evening! Ask about flip-flopping! Don’t let money stand in your way! 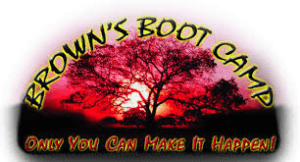 Brown’s Boot Camp is offering $100 off on our monthly 12-session program for all teachers. The cost is only $150 per month for 2017! Check out our website for times and locations. www.brownsbootcamp.com. For more information call (520)339-8878. A start to a new you is only days away! Want some? Get some! 20% discount on all services for teachers, every Sunday, Monday, and Tuesday. For a free consultation on the cut and color that is right for you call Carlos Ortiz at (520)888-7577. Conveniently located at 1245 E. Fort Lowell Road. Offers customized treatments at one fair price with no hidden costs or upgrades. Services are available Tuesdays through Saturdays from 9 a.m. – 6 p.m. Provides a permanent 10% discount on services. Also offers a rewards program and a referral program. Carol is a master waxer and aesthetician who has worked on over a hundred celebrities. To find out who those celebrities are, you will have to see for yourself! Location: two 2 blocks from the U.of A. Call 520-327-3389. Want to have as much energy as your students? Love the kids, hate the stress? Casabona Chiropractic invites you to enjoy a free consultation and examination. Receive 20% off additional treatments or services. Call to schedule your appointment today! 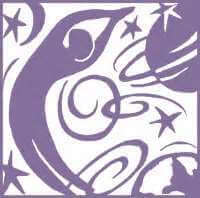 Join Curves on Thornydale for $34 a month and no enrollment fee. That is a savings of $40 at sign up and $150 savings for the entire year! Curves is a fitness & weight loss facility designed especially for women, but men can take advantage of this special too by passing it on to a female friend or relative! Call us today at 531-9181 to schedule a free fitness assessment. We look forward to working with you on reaching your fitness goals! *Valid at the Curves on Thornydale only, 6741 N. Thornydale Road in the Northpointe Village Center. Prices vary by location. Special based on a 12-month recurring billing fitness membership. Cannot be combined with any other offer. No cash value. 20% discount when you sign up for 6 months or more, 15% off for shorter sign-ups. Reduce tension and stress, improve circulation and promote well being. Each experience includes a complimentary consultation, customization of service to meet your needs, and spa water. *Please mention card at time of booking and present at time of service. Offers valid Tuesday thru Thursday at any Gadabout SalonSpas location. Teachers receive 10% off any service and all skincare products. Mention this promotion when booking to receive the special offer. Each treatment is performed by a licensed acupuncturist and lasts 45 minutes to one hour. Treatments can include a variety of techniques including acupuncture and cupping. This 30% savings offer can be used for three individual treatments, after this initial savings, teachers can enjoy an ongoing 20% discount. Offer is valid for single treatments only and cannot be combined with any other packages or offers and excludes insurance billing. To schedule an appointment visit http://invigorateacupuncture.com/, email kate@invigorateacupuncture.com, or call (520)370-6069. Teachers save 20% off standard price, 5% off promotional price of LASIK or PRK. Discount cannot be combined with any other offers or discounts. Offer valid for your first purchase of a 60-minute or a 90-minute massage session or for a Gift Certificate purchase. After this initial 25% savings, teachers enjoy an ongoing 10% discount. TVT discounts valid Monday through Friday. Open into early evening. Please call in advance to schedule your appointment. Mary Kay offers premium skin care, cosmetics, body care, sun care, and fragrance solutions for both men and women. Our expert team of scientists uses the most advanced skin care technology available to ensure that consumers get what they want: innovative products they can believe in at a price they can afford. Each Mary Kay Consultant is a self-employed, small, & local business in her community. 15% discount year round on everything in our Mary Kay product line. Fast & Free delivery in Tucson/Sahuarita/Nogales. FREE shipping on orders of $75 or more. Please contact Mary Kay representative Heidi Aldrich at (520) 270-0022 or haldrich@marykay.com. Mindful Yoga Studio offers teachers one month of unlimited yoga for $65. Classes include: Yoga Basics, Bliss Yoga, Candlelit Yin, Gentle Yoga, Flow Yoga, and Yoga 1 & 2 — all with convenient late afternoon and evening hours. Mindful Yoga Studio is located next to Trader Joe’s at the corner of Speedway and Wilmot. To see their full schedule, click here. With 4 Tucson locations, state-of-the-art fitness equipment, and low-priced gym memberships, choose Platinum Fitness — where health meets affordability. Takedown Plan (Golf Links location only): $99 enrollment and $99/mo. with a six month agreement or $129/mo for a month to month agreement. This membership includes boxing classes, Crossfit, and Group interval training use of all locations, group fitness classes, tanning and hydra massage. Platinum Plan: $100 enrollment, $29.95/mo. Includes use of all locations, group fitness classes, tanning and hydra massage. Elite Plan: $150 enrollment, $19.95/mo. Includes use of one location, tanning or hydra massage. All new memberships will go through a full body assessment including a functional movement screen completed by a personal trainer (a $100 value). Platinum + Personal Training Experience $59.95 to get started on unlimited group personal training. Teachers receive a 15% discount off any service provided at Power and Exercise Fitness Center. Services include gym membership, personal training, and small group classes. Check out our prices and offers on Facebook at Power and Exercise Fitness Center. Our gym is a private studio with easy access off I-10 and Ruthrauff (between I-10 and La Cholla on Ruthrauff). Power and Exercise Fitness Center: (520) 449-2802 or powerandexercise@gmail.com. Most of the therapists at Rooted Therapeutic Massage & Bodywork offers teachers $10 off any 60 minute or longer treatment that we provide. This never expires, however it can not be combined with another discount/offer and cannot be used towards the purchase of a gift certificate. We require that when you book your treatment with us, you let the us know that you are a teacher and would like to use the Tucson Values Teachers discount that we offer so that we can schedule you with a therapist that is willing to accept this discount. Head to our website (www.rootedmassagetucson.com) to learn more about us! Sumits Yoga Tucson values teachers! We would like to offer Southern Arizona teachers $12 anytime class drop ins (save $4/class) and $89 for a monthly unlimited class pass (save $36/month). At SYT we provide a safe and welcoming space for the practice of Yoga for students of all levels. We exist in order to share the countless benefits of a regular yoga practice, create a space of encouragement, celebrate diversity and support the local community. Located at Grant & Swan, 4951 E. Grant Road, (520)428-1177. 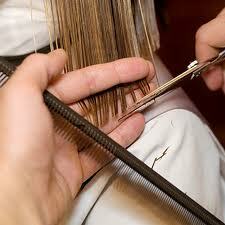 We will offer teachers a $40 dollar first examination visit and $27 dollar subsequent visits (adjustments). This is a savings more than we give most organizations. We offer Massage Therapy at our office as well. The Yoga Connection offers all teachers 10% off regular class card passes and monthly passes. The discount can be used toward class card packages of 6, 10 & 20 and Yoga Connection’s 1 month unlimited pass. Receive 20% off any regularly priced treatment. Must show Teacher Discount Card at time of purchase. – 3900 S. 6th Ave.
Finally…A carpet cleaner YOU CAN TRUST! FBI AGENT to CARPET CLEANER? Carpet cleaning – all repairs, replacement, dyes, and full restoration. If your service need is not listed here, ask – we most assuredly do it, too! Call and set up your free estimate today at 520-877-9300. For more information, please visit www.carpetpolice.com. As a small company, our prices are already lower than many other applicance repair companies out there. In honor of local teachers, Electro Mechanical Service Professionals offers 10% off all labor for Teacher Discount Card holders. 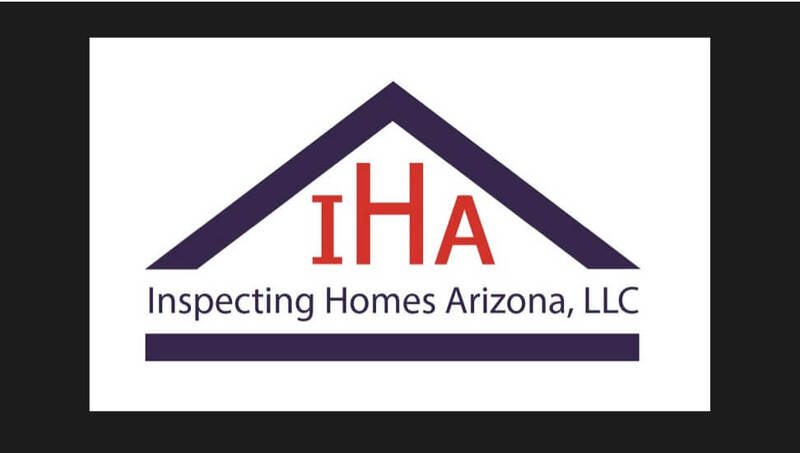 Inspecting Homes Arizona is offering a 10% discount on home inspections. Discount is off the advertised prices on the website. Visit inspectinghomesaz.com for more information. Call 520-990-0040. They are also listed on yelp! “Thank You” for your service! As a symbol of our appreciation we would like to extend a special offer to all Educators. 10% OFF Any Garage door service, sale or installation! 20% discount on labor for service or repairs along with a free safety evaluation of your home’s plumbing system. Schmitz Carpet Care is offering 10% off retail pricing of goods and services. These include carpet and upholstery cleaning, expert stain and spot removal, odor removal, tile and grout cleaning, repair and stretching, flood service, air duct cleaning and carpet protector treatments. Just call 520-623-3260 to schedule an appointment. The Maids proudly offers $35 off to new customers in the Tucson Values Teachers discount program on a full initial home cleaning. The Maids provides a team of three to four people with all necessary supplies to provide a deep, thorough cleaning of the home using our specialized 22-step Healthy Touch cleaning system. All of our products are botanically derived to be safe for the home and the environment. Our vacuum uses a 4-filter system, including a HEPA filter to remove 99.9% of dust and allergens from the air and surfaces of your home. Our service comes with a 100% satisfaction guarantee for every cleaning. If you are not completely satisfied with any area, call our office within 24 business hours – we will return and re-clean it at no additional cost to you. The Maids proudly serves the Tucson Metro-area, Green Valley, Sahuarita, Vail, Corona de Tucson, Oro Valley, Rancho Vistoso, Saddlebrook, Dove Mountain, Continental Ranch, and Gladden Farms. 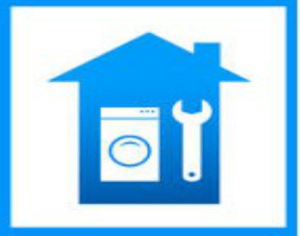 YourLocalSecurity.com is a national reseller of ADT home security services. Teachers get a FREE Security System valued at $850 with a $99 customer installation charge and purchase of alarm monitoring services. PLUS, teachers will receive a $100 Visa gift card! Come visit one of the world’s most unique facilities dedicated to the research and understanding of Earth System Processes. The Biosphere 2 facility serves as a laboratory for controlled scientific studies, an arena for experimental research and discussion, and a far-reaching provider of science education. Its mission is to serve as a center for research, outreach, teaching and life-long learning about Earth, its living systems, and its place in the universe; to catalyze interdisciplinary thinking and understanding about Earth and its future; to be an adaptive tool for Earth education and outreach to industry, government, and the public; and to distill issues related to Earth systems planning and management for use by policymakers, students, and the public. Programs for K-12 students and teachers are central to our education and outreach mission. Biosphere 2 offers teachers discounted general admission at $12 with TVT Teacher Discount Card and School ID. Brush and Bottle is proud to offer all Southern Arizona educators, spouses, and immediate children $5 off any regular public class. Sign up at www.brushnbottle.com. Uncork your inner artistic ability in a fun and relaxed atmosphere. A local artist leads you step by step in recreating the painting of the day. At the end of the night you take your masterpiece home! Brush and Bottle is a BYOB, and you can bring wine, beer and appetizers to the event. Canvas, paint, brushes, aprons are provided. A perfect place to celebrate birthdays, date nights, girls night out, bachelorette and holiday parties. Please contact us at 520-407-6410, email us at chris@cantwaittocruise.com. Free Teacher Wristband when school ID is presented! 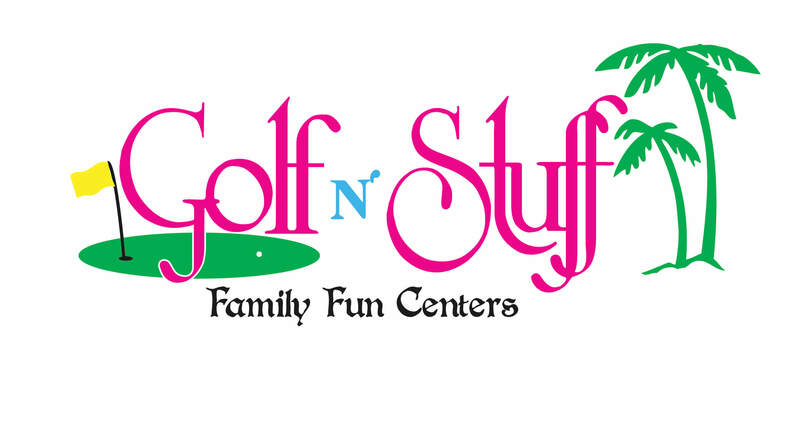 Golf N’ Stuff Family Fun Center is open year-round and is proud to feature two 18-hole miniature golf courses, complete with whimsical scenes and beautiful water features. Enjoy our other great attractions to include zippy go-carts, wet n’ wild bumper boats with super soaker squirt guns, hard and soft ball batting cages, and laser tag where “you are the game!” We offer the largest arcade in Southern Arizona inside our medieval castle with over 100 arcade games, and a complete snack bar. 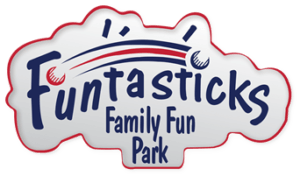 We proudly host birthday parties, corporate events, and large group outings. Call our Group Sales Coordinator at (520) 296-2366 ext. 13 for more information and reservations! 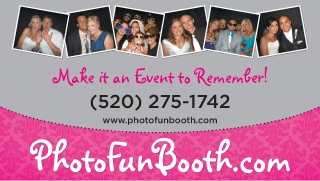 PhotoFunBooth is the hot new trend in event entertainment and memorabilia. PhotoFunBooth is a locally owned and operated business that has been helping numerous companies and individuals since 2005 make their events ones to remember. We pride ourselves on being Tucson natives and have developed a strong reputation of professionalism and customer service while creating a fun and memorable experience. The Craft Revolt is offering a teacher evening on the second Saturday of every month to the paint and sip, or craft workshop. Teachers can bring a friend for free with one paid class sign up. Bring in your Teacher ID to the box office to receive a discounted teacher membership for only $60! The Loft Cinema is a local nonprofit dedicated to creating community by celebrating the art and diversity of film. Your membership support helps bring the Tucson and Southern Arizona community great films, fantastic special events, and free programming. Special offers for UA Presents will be available on selected events throughout the season. Please check back later for details for the 2018/2019 season. 15% off dine in or pickup at all locations. Discount cannot be used with online orders. Baggin’s Gourmet Sandwiches is Tucson’s favorite local sandwich place since 1984. We make most items in our main kitchen & deliver fresh real food to our 11 locations daily. Catering and lunch delivery available. 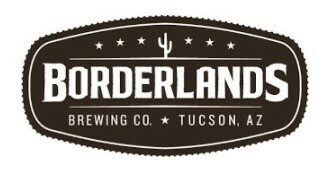 Borderlands Crafts Quality Beers in Traditional Southwestern Style. Teachers, with a current and valid teacher ID, will receive 25% off their tab (on pints only). Not valid for merchandise, kegs, cans-to-go, etc. This offer will also apply during teacher appreciation week even if they are back in their classrooms. Not valid in combination with other offers. 10% discount to teachers on any regularly priced purchase, including merchandise. 2 for 1 Teacher Tuesdays! Every Tuesday, enjoy 2 for 1 entrees at any of our restaurants! Take a 15% discount on any entrée, any day. Not valid with any other promotions. Take a 10% discount on any entrée, any day. Not valid with any other promotions. Does not apply to alcohol purchases. Please note that this offer is only applicable to the individual with the Teacher Discount Card and does not apply to other guests in the party. Teachers will receive a 15% discount on food enjoyed at The Cup Cafe. The offer is available for dine-in only and excludes alcohol. Valid only with the TVT Teacher Discount Card and cannot be combined with any other offers. One discount per visit. Artisan pizzas with fresh ingredients, sandwiches, hamburgers, award-winning fries, pastas, salads and desserts, complemented by an extensive wine list and full bar. The upbeat and unpretentious environment and high-quality dishes continue to earn Humble Pie its reputation as a neighborhood favorite. Teachers will receive a 15% discount on food enjoyed at Maynards Market, and Maynards Kitchen. The offer is available for dine-in only and excludes alcohol. Valid only with the TVT Teacher Discount Card and cannot be combined with any other offers. One discount per visit. A tradition for nearly 40 years, Peter Piper Pizza continues to adapt to meet the needs of today’s families. With quality pizzas on made-from-scratch dough and the industry’s hottest games, all priced at a reliable value, Peter Piper Pizza remains the ultimate food and fun destination for friends and family. 15% OFF all food and soda purchased at menu price. Our focus is on quality ingredients and quality interactions. We offer a unique venue, where you can meet, eat and drink in Tucson’s thriving downtown. Teachers can enjoy a 10% discount on your ENTIRE bill, excluding alcohol and bottled beverages. Please present your TVT Teacher Discount Card when placing your order. This discount is not valid with any other offer/discount. The Fix validates parking for the Tyndall Ave. Parking Garage after 5pm. Free parking on weekends! The Living Room’s open-air and welcoming environment are signature. Both the interior and patio areas have comfortable, social and soft seating areas to stretch out or get cozy. The Oink Cafe is a family owned and operated modern cafe serving homemade breakfast and lunch, handcrafted espresso drinks, premium beer, cocktails, and above all else, BACON! 8 delicious flavors of bacon. You may commence drooling! Have a flight of bacon and try all 8! Our aim is to bring fresh food, made from scratch, to you daily. But wait! We are more than just bacon…for lunch, our huge sandwiches and salads cannot be beat. We look forward to serving you! Buy one item, get a second of equal or lesser value free. Regular menu items only. In a fast-paced world, the kind of food that is meant to keep up isn’t necessarily fresh, or healthy. Luckily, places like The Rice Bowl break the mold. As a locally owned and operated quick service restaurant, we show Tucson a taste of the Orient with our creatively designed menu including Japanese rice bowls always made with freshness in mind. Select Ace Hardware locations are offering a teacher discount for the 2018-2019 school year! Enjoy 15 % off regular priced items (*some restrictions or exclusions may apply). To receive this offer, show your school credential or your Teacher Discount Card. Thanks to all teachers and educators for their service. 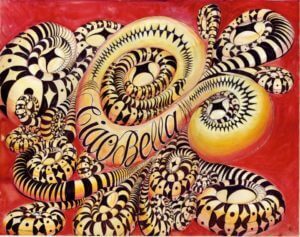 Ciao Bella offers teachers a 25% off all clothing and accessories. Ciao Bella is a new locally owned clothing boutique in the Lost Barrio area of Tucson. Specializing in new, gently used, and vintage clothing, with a focus on creating wardrobes for the working woman. Our range includes designer suits and separates, beautiful silk and linen shirts, as well as a great range of casuals and evening wear. We belive every working woman should be able to dress beautifully without the expensive pricetag. We’re a full-service local florist that is family owned and operated. Our knowledgeable staff is ready to assist you with placing orders for local delivery or anywhere in the world. For your convenience, we offer daily floral delivery to local funeral homes and hospitals. Please call to receive discount offer. 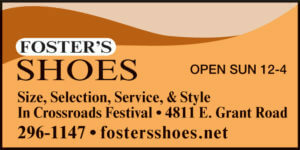 Foster’s Shoes,a locally owned shoe store, has been in business for 26 years. We would like to show our appreciation to teachers by offering $12 off all regular priced women’s shoes $70 or more. Come visit us and check out our selection of stylish, comfortable and well fitting footwear. We carry shoes in sizes 5 to 12, and widths super slim to extra wide. We offer size, selection, service, and style. Show your TVT Discount Card to receive this special discount. 20% discount* for teachers on Thursdays and Fridays at all Goodwill of Southern Arizona retail stores; outlet locations are excluded. *Teachers must provide valid school ID and their Tucson Values Teachers Discount Card. Discount only applies to donated goods. Cannot be combined with other discounts and excludes new goods and pink tag items. Hotels.com has over 145,000 hotels in more than 60 countries. Whether you are travelling last minute as a family or need a hotel for business, we have the right hotel deal for you. Teachers can save Up to 10% OFF select hotels at Hotels.com. $7.00 watch battery replacement (includes tax). Limit 3. Reg price $10.50 and up (High-end timepieces excluded). The Scentsy candle system is a unique candle warming system. A small-watt light bulb warms highly scented wax into a pool of melted wax. The result is a long-lasting, safe, and affordable alternative to flame candles. No flame, wick, lead or soot. A scent-sational way to scent your home, office and classroom. Scentsy Gift Bundles $50: Choose from 7 different bundles. Each bundle includes a Scentsy Warmer, 3 Scentsy Bars, coordinating gift box, ribbon and label. Contact me for my monthly special at 975-8993 or mvigil2@cox.net. Don’t forget to request a free catalog and scent sample. 10% discount for 6 months on all self-storage plus a FREE lock with rental. Offer good at all Tucson, Oro Valley and Sahuarita facilities. Please see managers at each site for details. Long-distance interstate moves will be provided at cost with no additional booking commission. All local moves will be discounted 15% and be covered by two professional movers with a fully equipped truck. Packing is not included but packing services will be provided at a 10% discount and used cartons will be provided for self-packing at no charge based on availability. U-Stor Self Storage would like to show their appreciation to the teachers of Southern Arizona and honor ALL local school employees with a 25% discount off of the first three (3) months of storage rental. Please present your TVT Discount Card and school ID to receive the discount. 20% off local orders. View the full catalog of children’s books and gifts at http://www.readingclubhouse.com. Call 520-444-5638 or email allison@barefootbookstucson.com to place your order. Friends of the Pima County Library offer teachers an ongoing discount of 25% off regular prices at their Community Book Sales. The Friends offer thousands of great books and more at incredible prices. Please visit www.pimafriends.com to find out more about the Friends and how your support benefits our community and the public library. Usborne Books & More features inspiring and educational award-winning books and activities for children of all ages. These are the books kids LOVE to read! Open a world of possibilities at www.ReadMoreUsborne.com. Teachers receive a special offer with your first order! Please contact Melissa directly at melissa@ReadMoreUsborne.com or (520) 603-3465 for offer details and to learn how to obtain free and discounted books for your home and classroom. 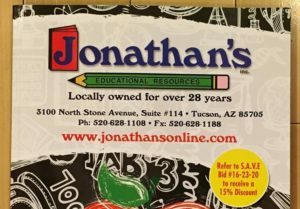 Would you like to offer a discount to Southern Arizona teachers to show your appreciation? Sign up here!